The new Pumaspeed Focus RS mk2 2009 Uprated intercooler is the newest edition to the Exclusive Pumaspeed product range. Why does the Focus RS Mk2 need an Uprated Intercooler? The original Ford intercooler has limited performance capabilities,even the official Ford MP350 Focus RS developed by Mountune has an uprated intercooler to keep the inlet temperatures low. The New RoadSport Intercooler range from Pumaspeed Performance offers the perfect mix of high performance cooling at a sensible price. It comes complete with the very popular ,and we believe essential, Air Scoop / Diffuser system that channels air directly into the huge 60mm Focus RS Mk2 Bar And Plate super efficient Intercooler core. The resulting huge amount of ducted cold air flowing into the New Focus RS Mk2 Roadsport Intercooler will give very stable charge temperatures even in the harshest high temperature enviroments. It has been designed to be used on the Road and Track and in hot climates by using a much more dense fin structure thean the nearest rival. We believe this unit will lead on Price and Performance with a fin density greater by upto 50% , making it the Ultimate affordable Intercooler kit. The new designed Pumaspeed RoadSport Focus RS mk2 Intercooler features top mounted oil cooler mounts for the quick and easy front facing installation of all good quality oil coolers which will give the very best in protection for your engine. The most important feature - Pumaspeed have specified a much higher cooling fin density that other coolers on the market to ensure you get the highest cooling. The smoothed and flow tested end tanks offer unrivaled performance, and with simple Bolt on DIY fitting kit , this is one of the most functional and affordable kits available. Black (Stealth Look) or Regular Silver finished available. Please see below how the RS horn attaches to the Roadsport intercooler. The Pumaspeed Workshop team are ready to fit the Special Offer R-Sport Stage 1 Focus RS Mk2 60mm Intercooler with Scoop in our Head Office located here. We estimate the labour time to be approximately 0.85 hour(s) costing £66.30 inc VAT. Therefore making parts and labour a total cost £406.26 (inc. VAT). 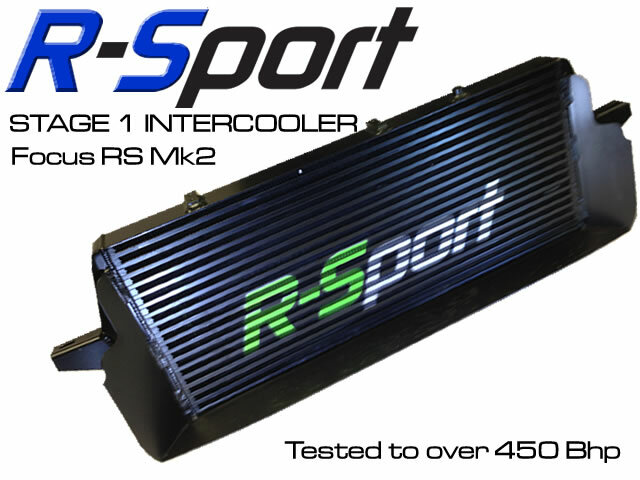 Pumaspeed have a specialist distribution team that can dispatch the Special Offer R-Sport Stage 1 Focus RS Mk2 60mm Intercooler with Scoop to any destination worldwide.